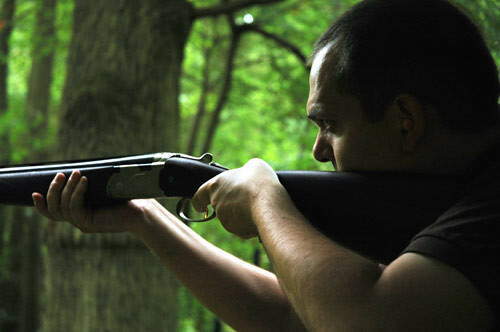 If you were born or raised in this country you respond to holding a shotgun in one of two ways. Either it nestles in the crook of your arm like it was put there at birth, your back straightens and the fine profile of one our proudest landed gentry hoves into view. You sprout tweed. Your desire to do damage to small birds flares and you suddenly own a hip flask. The other, is that you immediately adopt a cockney accent, start banging on about "shooters", "blags" and "lock ups down the Old Kent Road", sprout a Crombie jacket and have a desire to saw off about 12 inches of the barrel and "do someone up like a kipper" or something to that effect. Out of the 12 men who attended the celebratory clay pigeon shoot on Saturday morning it was roughly 11-1. In favour of the cheap cockney villains. The other bloke was already wearing a tweed so it seemed a foregone conclusion. This is stage one in completing one of my very own items in the meme below. Eating something you have killed. I figured practicing on fast spinning bits of clay would do everyone a favour before I let myself even attempt it on a living thing, and yes, it is me holding the gun and yes, I do look like a cockney villain. finally see what you look like, sort of. it reminds me of that old show "home improvement"--did you get that in the UK? the neighbor always appeared over the garden fence so you'd never see his entire face. How did the clay pigeon taste?